Most readers of this blog are familiar with reconstructions, sketches, and diagrams of the Tabernacle. From our reading of the text and with some help from Bible encyclopedias and study Bibles, we know the Tabernacle inside and out ... the courtyard, the altar, the tent itself with its various coverings, the outer room, the Holy of Holies, the various articles in the rooms, how the items were arranged in the court and in the tent, etc., etc. 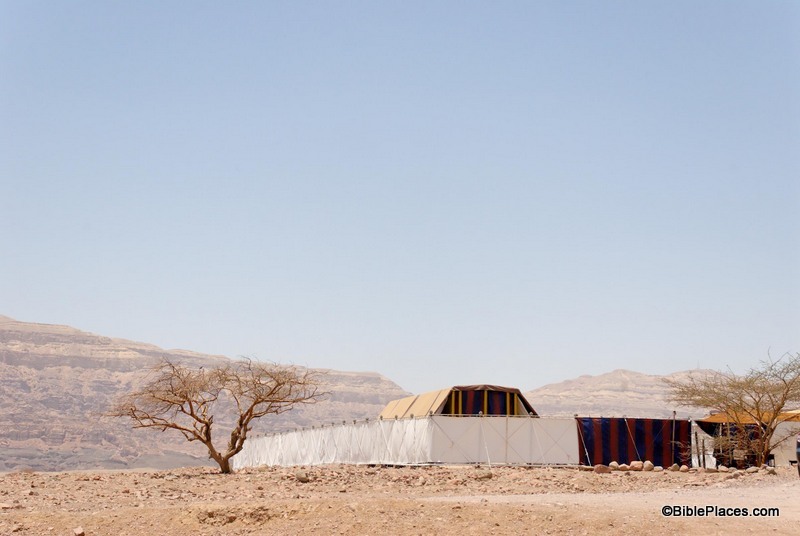 But did you ever stop to think what the Tabernacle looked like to an ancient Israelite? I'm not talking about the priests and Levites who ministered in the Tabernacle, but just your average Israelite man or woman who would have passed by the Tabernacle on their way from one side of the camp to the other. What it would have looked like to their kids as they approached the Tabernacle, bringing the sacrificial animals that God had required? How much of God's tent could the average person see from outside the courtyard? The model was created in 1986 by the Bible Center Theological Vocational School in Breckerfeld, Germany. It was displayed at exhibitions in seven European cities, mainly in Germany and Switzerland, before being erected in the Timna Valley. You can see better pictures of the model on the BiblePlaces website here, but this particular image caught my attention because it is what the average Israelite would have seen on an average day. The outer screen of the Tabernacle's courtyard blocked most of the tent from view (Exod. 27:9-18), but someone standing outside could still see the top of the Tabernacle itself over the top of the screen. We know this because the height of the Tabernacle was at least 10 cubits (Exod. 26:15-16) while the height of the screen was around 5 cubits (Exod. 27:18), so the screen was only half as high as the tent. A cubit is the length from the tip of your fingers to the tip of your elbow, thus in modern measurements a cubit is approximately half a meter or 18 inches. So to be more exact, the Tabernacle stood at least 5 meters (15 feet) tall and the screen was about 2.5 meters (7.5 feet) high. You would not be able to see anything if you were standing right next to the screen (unless you were extremely tall, like Goliath), but if you stood back away from the screen, the top of the Tabernacle could be seen towering over its surroundings. This image and over 700 others are available in Volume 5 of the Pictorial Library of Bible Lands and can be purchased here for $34 (with free shipping). Additional information and images of the Tabernacle model can be seen here and here on the BiblePlaces website. For my thoughts about what happened to the Tabernacle after it was retired, see my posts on the Wild Olive Shoot blog here and here.